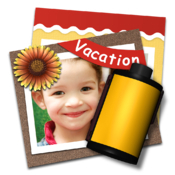 iScrapbook is the #1 scrapbooking application for OS X. It's designed for both novice and professional scrapbookers. iScrapbook manages the entire scrapbooking process from page design to album organization. iScrapbook includes everything you need to digitally scrapbook on your Mac. It includes a class-leading assortment of design tools, drawing shapes, artwork, templates, and more. Most digital scrapbookers end up with thousands of artwork images on their computers. Browsing, searching, and managing thousands of images has proven to be an almost impossible task for most scrapbookers. iScrapbook works with packages of related images called "iScrapKits". An iScrapKit is more than just a collection of high-quality graphics. iScrapKits also contain built-in information about the kit and the graphics in the kit. This information makes it easy to browse and search for the perfect graphic without any setup on your part. For example, you can quickly search your iScrapKits for an orange bow made out of ribbon. When searching for the perfect graphic, you can search by name, tags, primary color, secondary colors, and actual colors. iScrapbook comes with 67 FREE iScrapKits (worth more than $155). With thousands of images to choose from, the scrapbooking possibilities are endless. iScrapbook comes with twenty-five 2nd generation Smart Templates that will revolutionize your scrapbooking experience. Each Smart Template has been professionally designed and shows you exactly where to place papers, embellishments, journaling, and more. The templates are "smart" because the software understands what each placeholder on the template represents. For example, double-click a ribbon placeholder on the template and iScrapbook will show you all of your ribbons. The ribbon will even be automatically resized to fit the space. Smart Templates are so amazing because they help you create custom scrapbook pages in just a few clicks. In addition to the Smart Templates included with the software, you can create your own Smart Templates for future projects. Chronos will also be offering additional professionally-designed Smart Template packs for sale in the future. Group your scrapbook pages into as many albums as you'd like. You'll be able to see your pages side-by-side as they would appear in a book. Plus, you can even create page spreads that span two pages. iScrapbook automatically loads your photos directly from iPhoto. Just drag them onto your page. It couldn't be easier. Text is magic in iScrapbook. Bend it along a curve. Spiral it to tell a story. Or use text to crop an image. It's so easy that it's fun! The iScrapbook Store offers the best shopping experience in the world for digital scrapbookers. The store features large previews, consistent pricing, and beautiful artwork categorized by theme, style, and artist.